The Key Phrases endpoint will return the key talking points in the input text as a string array. Clever stuff. The Detect Languages endpoint takes an input string and returns the detected language with a score between 0 and 1. Scores close to 1 indicate 100% certainty that the identified language is true. A total of 120 languages are supported. Not entirely sure how this would be useful in a bot (these Text Analytics services aren’t bot-specific), but if you think of a good use case let me know! This one is insane. The Detect Topics endpoint returns the top detected topics for a list of submitted text documents. A topic is identified with a key phrase, which can be one or more related words. At least 100 text documents must be submitted – but it’s designed to detect topics across hundreds to thousands of documents! Ridiculous. Obviously, this won’t return a result immediately, so you need to call the Operation Status endpoint to check how processing is progressing. 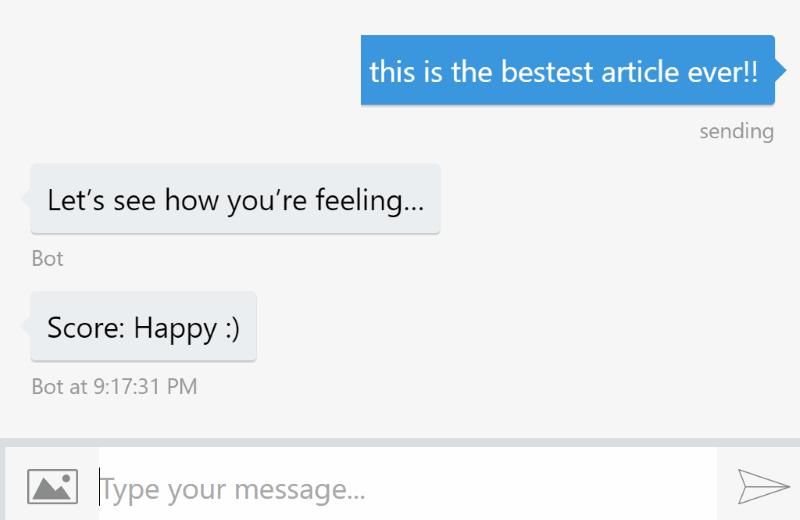 The Sentiment endpoint will take a piece of text and give a score between 0 and 1, with 1 being totally happy and 0 being totally unhappy/angry. 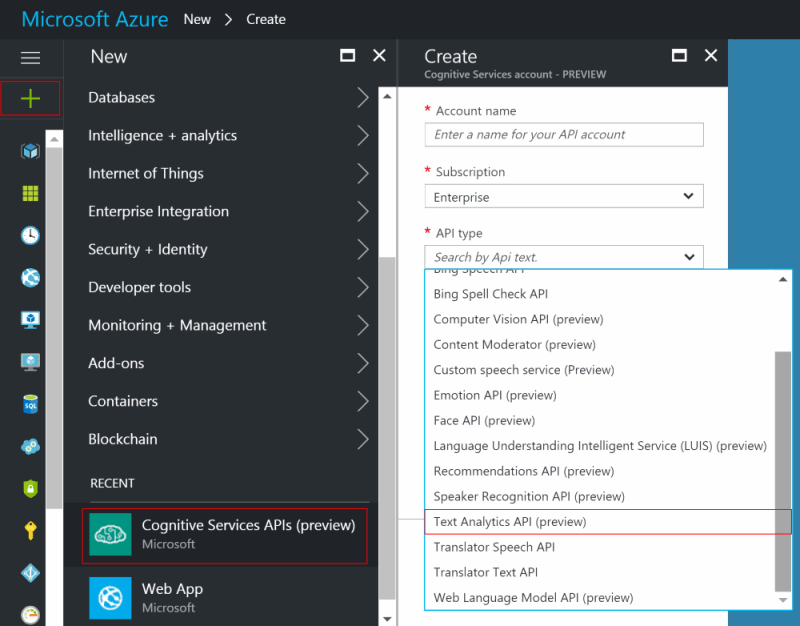 In order to use the Text Analysis API, you’ll need to sign up for Azure and get a Cognitive Services key. // This is the data we're posting. // Anonymous types are fun! // Dynamic types are fun! One great way to integrate this could be to have your own dialog that always calls the api and exposes the score in much the same way as the LuisDialog exposes a LuisResult. Cool, huh? 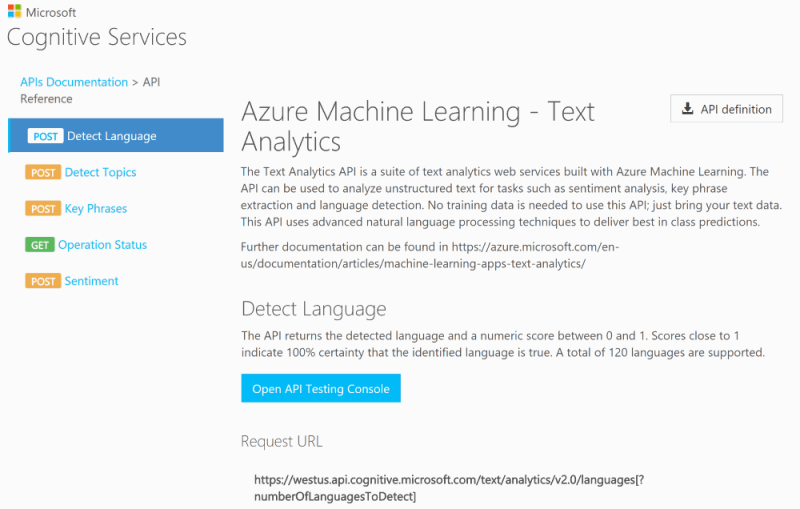 Let me know how you plan to use the sentiment analysis API – or even how you’d use the other Text Analysis endpoints! ← MVP led TechDays Online: Videos! ‘Detect Language’ can be useful for bots in a multi-lingual scenario. You never know what language the user is going be using, or would prefer to use. – Present responses in the right language – this would require responses to be set up in a way that support the multilingual concept as well; so never any hardcoded literals, but strings retrieved from a database. OR … transfer to a sister bot that speaks the right language. Hi, your post is really helpful. But i have a query can i use text analytics API with LuisDialog as i am using LUIS for my bot.